This 'heavenly' bread is so good cold...so I recommend refrigerating it. 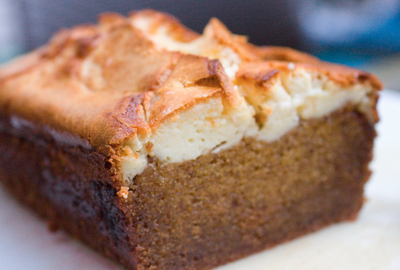 The cream cheese top creates the perfect compliment to the sweet, pumpkin flavor! 1. Preheat oven to 350 degrees. Spray 9×5 loaf pan with non-stick spray. 2. In a large mixing bowl, combine pumpkin, eggs, oil, water, sugar. Set aside. 3. In a small bowl, combine flour, baking soda, salt, and spices. Fold dry ingredients into wet mixture, just until combined. Pour into loaf pan. 4. Beat cream cheese, butter, and vanilla extract in a stand mixer with the paddle attachment until smooth. Beat in sugar until fluffy, about 5 minutes, scraping down in the middle. Beat in egg. Stir in flour. 5. Drop the batter in 6 large drops onto the pumpkin batter. 6. Bake immediately for 50 minutes. Turn the oven down to 300 degrees F and continue baking for another 30 minutes, or until toothpick comes out clean. 7. Remove from the oven and allow to cool in the pan for 20 minutes. Loosen all the edges and remove from pan carefully. It’s quite delicate. Allow to cool for 10 minutes before slicing. Serve warm for one version. Serve after refrigerating for a different texture. For more fall recipes, follow us on pinterest!